A couple of weeks ago I did my monthly perusal of the Artforum, finding mostly the usual suspects, stunning graphic images of art installations and paintings cropped beautifully in the service of glossy gallery adverts. Once in a while I’ll find a gem, an unusual find, something truly curious. And this time I certainly did, if only for a fleeting moment. There was a review of a show titled “I Work from Home’. Immediate thoughts – “Oh my gosh, me TOO!’, and it’s a woman artist, AND there is a re-installation of their project “The Suburban”. This is getting so close to home. Exciting. Michelle Grabner is having her first solo museum exhibition at the Museum of Contemporary Art in Cleveland. Part of the exhibit are her artworks and her projects, namely a full-scale replica of said “The Suburban” will be in the museum. 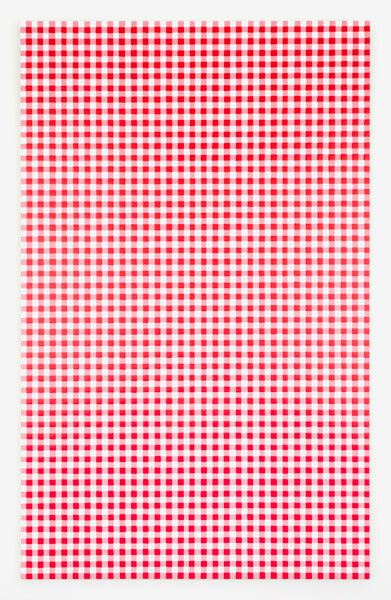 I jump to her web site to see her artwork – meticulous meditative paintings, some that even look like gingham (of suburban picnic table fame) hand painted on a large scale. There are lots of installations, sculptures that seem to wrestle with the ideas of space and subject in a very formal, don’t-over-share kind of way. Then I jump to The Suburban web site, the project founded by her and her partner Brad Killam in their former garage. The logo for The Suburban is a replica of the London Underground logo sans the color, suggesting public access, utilitarian, and underground. The history of the space I read is inspiring: a space born out of the necessities of artists outside a city that wasn’t giving much art love and support. The Suburban was a reaction to an uninviting art establishment. I check to see how suburban The Suburban really is. Oak Parks, Illinois is 16 minutes away from Chicago (9.2 miles). This is about the distance from the MET in New York to Soho and back, or if you walked from the Ghiberti doors in downtown Florence to the Piazza Michelangelo and back. This doesn’t feel too suburban now that I think of it. The mission of the space is to be anti-establishment, anti-curator, and artist run. Operating away from the usual fuel of the art world (e.g. sales and press), The Suburban proved fertile ground for many artists to realize projects over the years since 1999. So now that its founder Michelle Grabner is having a solo show at a museum, the little underground, anti-curator, anti-art establishment is being reconstructed in an art museum. Complete with three established artists’ projects rotating within “The Suburban” during the exhibition. Returning to Michelle’s web site I now read that she has shown her work in many established museums (Walker Art Center, Tate, Museum of Contemporary Art Chicago), has taught at a lot of established institutions (Yale, Art Institute of Chicago), writes for established art magazines (Artforum, Modern Painter) and is a co-curator for the Whitney Biennal in 2014. The work from home bit is getting a little foggy for me. The experimental and vulnerable angle of The Suburban is a little lost now too, now that I see the artists included are part of an inner circle, a curated set of friends and acquaintances. How truly out on a limb is this project? It sounds a little more safe and exclusive now. On The Suburban’s web site they write about their initial ideas of having an avant garde gallery in a strip mall. Now we’re talking. The little house out back of their property ended up taking the cake instead of strip mall space. Over the years it has done an amazing job of garnering press, international artists (Pierre Huyghe, Olafur Eliasson, Sarah Lucas) and even controversy – Bjork and Matthew Barney decided to launch their project at The Suburban after turning down the Art Institute of Chicago’s offer to host. It’s incredible what can happen when like-minded artists can band together and support one another. Which brings me to the like-minded part – I started my exploration of this artist and her projects thrilled with the thought of the outside, the inverted, the untapped. I end by realizing it is simply a mini-establishment, one that is just as exclusive, only smaller scale. I did appreciate their son’s description of their efforts on the web site, a true testament to having artist parents. Next time I dare them to sign that lease on the strip mall space, or better yet why not grab a mini-van and make a mobile avant-garde art gallery? I’d like to see that re-installed on museum grounds for sure. Michelle’s work and projects are highly commendable, I enjoyed very much this interview from last year with Barry Schwabsky from the Brooklyn Rail – her heart and intentions are so well placed in teaching and art it’s admirable. 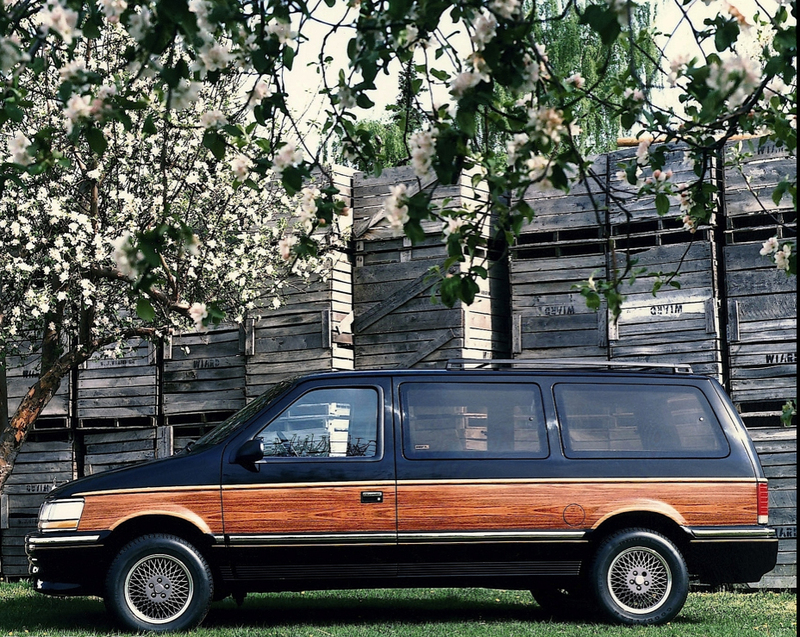 The Chrysler Minivan, 1991. The author’s first car and an iconic symbol of the American suburbs, and perhaps the nexxus for future avant garde art exhibits and happenings.